Crossroads Hoopsters ministers to young people through the sport of basketball. The average age is 16 - 25 years. While the participants are primarily men, many of them bring their girlfriends or wives and young children. We meet in the gym on Sunday nights at 5:30 for open gym basketball. The goal is to provide a safe, Christ-centered environment to play basketball and build relationships. Each and every week the gospel of Jesus Christ is presented both in word and in actions. 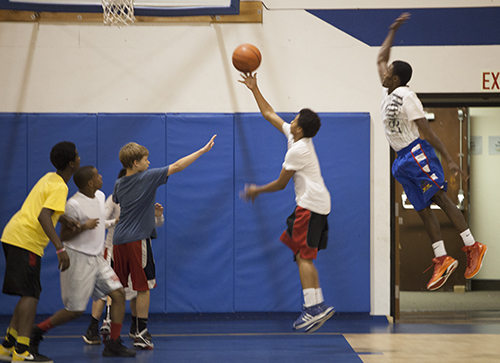 Another purpose for the Hoopsters is to provide mentoring, life skills, and leadership training. We offer GED test preparation, help with preparing job applications and resume’s, and access to computers for on-line job applications. We also act as liaisons to employment, educational, and recreational opportunities. As donations have come in, we try to provide food and beverages each week. Sometimes they have special speakers come in to share. We've had the athletic director from Columbia Christian and the head of cardiology at Portland Adventist come in to speak.